Discolored ceilings are a strong indicator of roof leakage. Since water usually moves along the roof panels, water intrusion does not necessarily have to occur near the source of the leak but can manifest itself in different areas inside your home. After eliminating the possibility of a leaky pipe or drain, consult a roofing professional to inspect your roof for leakage issues to avoid further damage. Roofing granules protect shingles from harmful UV exposure. Extreme weather conditions can contribute to the loosening of granules and facilitate a backup in downspouts. While surplus granules in gutters can be traced to excess shedding after a new roof installation, faulty drain pipes on aging roofs are most likely a sign of deteriorating shingles. Over time granule surfaces lose their adhesive qualities which can lead to brittle or cracked shingles. Hail, wind and rain are major contributing factors of granule surface erosion. If you are suspecting that your gutter inefficiency is caused by granule accumulation in your draining system, contact a roofing expert for an evaluation. Dark patches or uneven color on parts of your roof can be attributed to missing shingles. Not only are these aesthetically unappealing, but they could indicate a more serious underlying problem. Chipped shingles could be caused by wild animals lodging on or under the roof. Another contributing factor is aging sealant strip; shingles have adhesive on their underside which can become brittle over time and result in loose shingles. 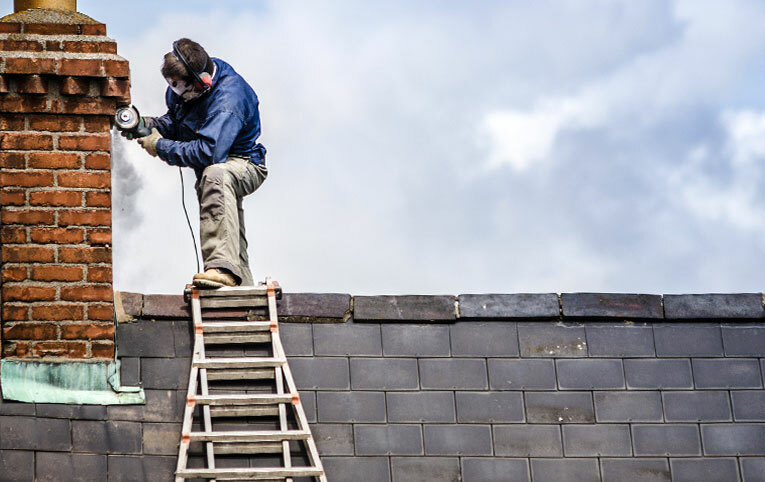 If you notice crumbling, curled or missing shingles or find shingle particles in your gutter, call a roofing expert to have them replaced right away. A waterlogged ceiling can cause damage to your drywall or lead to wood mold and rot, which will be a lot more expensive to repair than exchanging individual shingles. The impact of a hail storm can vary greatly and many homeowners may not even be aware of any roofing issues caused by it. Hail damage to wood shingles and asphalt and composition shingles differs substantially. Whereas wood shingle damage can be identified by brownish splits, hail hits to asphalt and composition shingles cause bruises that are black in color and result in a loss of granules, which makes them prone to harmful UV rays from the sun. More intense hail storms can even result in tearing or puncturing of shingles. If you believe that your home has sustained hail damage, contact a roofing contractor for a free roofing estimate. Metal roof flashing keeps water from leaking into your structure at roof joints. Professional flashing work is both time consuming and costly, therefore metal flashing is frequently substituted with layers of roof cement. Cement is only a short-term solution as it tends to harden over time and is susceptible to cracks and leakage. Tar or fabric flashing is not only unsightly, but it can cause substantial damage to your home interior in the long run; it should be replaced by professionally installed metal flashing instead. Contact the experts at ProPoint Roofing & Construction with any questions and well be happy to help. Serving the Western Wisconsin and surrounding areas including La Crosse, WI , Eau Claire, WI , and more.